Super cute pillow that looks great on the gray couch in our playroom. I am updating the playroom now that my girls are all tweens and teens and this was a fun addition. This pre-filled pillow from Saro Lifestyle is nothing but positive vibes as it greets you with the words 'Hello Gorgeous' and playful tassel trim in rainbow of colors. Down feather pillow insert included. Dimensions 18.0 In. X 12.0 In. X 3.0 In. 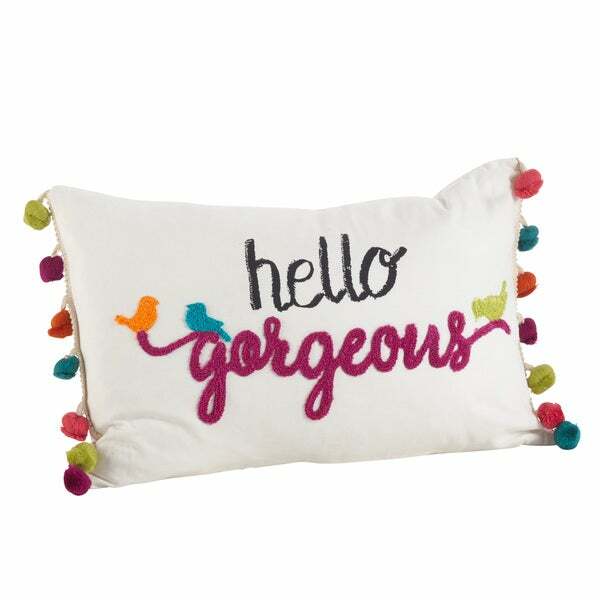 I ordered two of these adorable pillows, because who doesn’t want to wake up to a “Hello Gorgeous” brightly colored message every morning?!! My husband and I enjoy the whimsical look they add to our bed. The quality is perfection. It's a very cute pillow and fits perfectly on my office chair. HOWEVER, it smells like a dead carcass was stuffed in the down feathers. Is it supposed to smell this horrible? As soon as I took it out of the packaging the smell hit me. I don't recall my down bed pillows smelling this bad. I did spray it with febreeze so we'll see if that works. Absolutely adorable love. Exactly as pictured.